This week I will be working on Woodland Clover, a Pat Speth pattern. I was able to take a workshop with her last Wednesday and got a pretty good start. 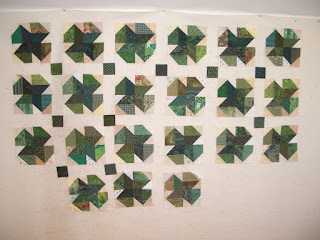 I am using up my green stash for this one and will keep making blocks until it is used up-maybe another 20 or so. It is set with neutral sashing strips and has an interesting border- Will post more photos as I make progress. See what everyone else is working on this week at Patchwork Times. Oh these blocks are looking good! Love all those greens! Very cute! I wish I had some green in my stash to try it! Your photo caught my attention immediately. I recognized it as a Pat Speth pattern. I was fortunate to attend 2 days of workshops with her a few years ago at our LQS, and it was a wonderful learning experience. Her workshops are packed with information and fun. 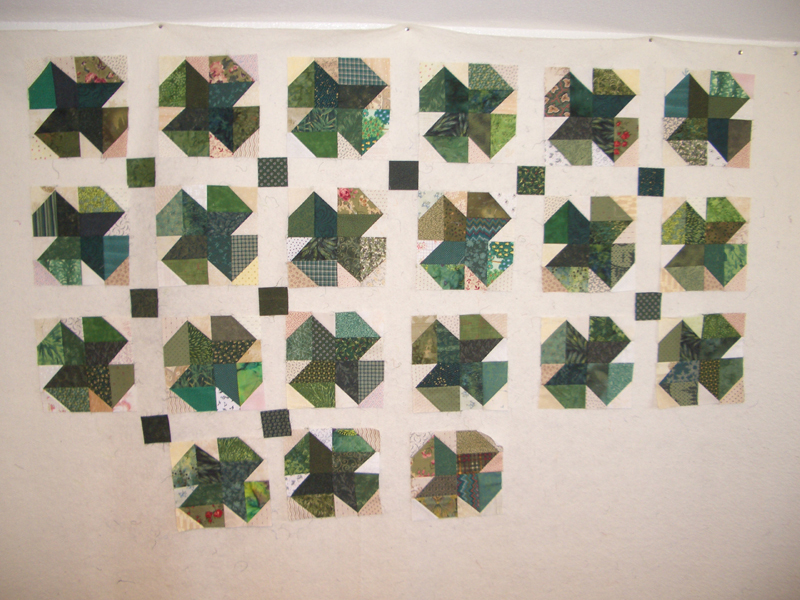 Your green blocks are great, and it's going to be a special quilt. So nice to see you back on your blog, I missed looking at your blog. I like the green clover, be anixous to see the rest of the pattern. Be seeing you soon.